Jimboba is a fellow Scotsman who like this Scotsman really loves 15mm science fiction wargaming. Recently he posted images of some of his collection of 15mm alien characters and I asked him if it would be cool for me to feature his SHM Range aliens on our blog. He agreed and indeed sent some more specially taken pictures (in the real world he is a talented graphic designer) for us to use. You can see them below. You can also see the original blog post on Warchest HERE from which these characters and their stories are taken. 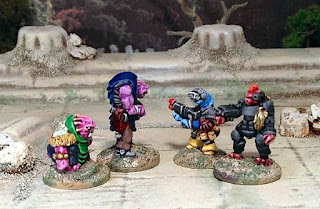 If you like the look of these 15mm aliens which are excellent for any set of rules or setting you can see them all at the SHM 15mm Science Fiction Range on the website. 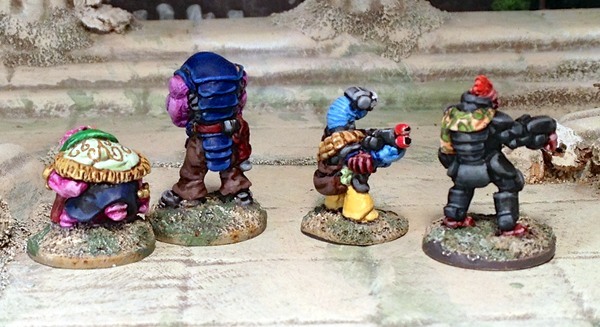 They are from left to right: SHM31 Baroka Crimelord, SHM50 Razak Bouncer, SHM66 Skorath Mercenary and SHM30 Gizbin Mercenary. These are all miniatures designed by Eli Arndt. HOT 15mm War Mammoth and War Elephant return! Tabletop's classic 15mm Rhinosaurs return!